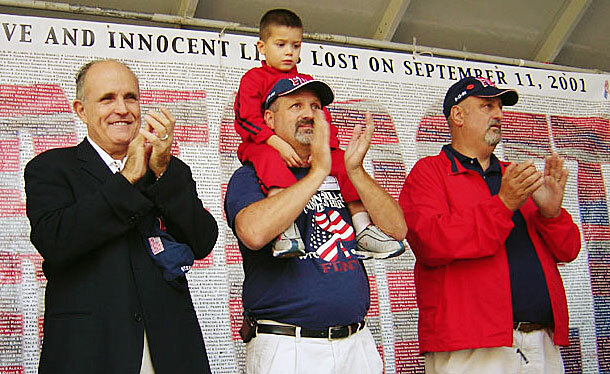 Mayor and current Republican Presidential candidate, Rudy Guiliani on stage with the Siller brothers, the ArtAID NEVER FORGET in the background. 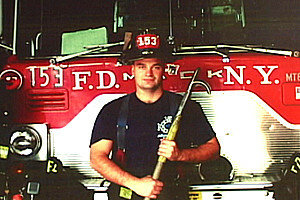 Stephen Siller, made the Supreme Sacrifice on September 11th. Stephen Siller, beloved husband and father of five, was a firefighter from Squad 1, Park Slope Brooklyn. On 9/11, he was off-duty, and on his way to golf with his 3 older brothers. When Stephen heard on his scanner that the World Trade Center had been hit, he turned his vehicle around and headed towards the site. When his truck was prohibited from entering the Brooklyn Battery Tunnel, typical of him, he raced on foot towards the site with his gear strapped to his back. He was last seen alive on West and Liberty Streets where he, more than likely, went looking for his Squad, all of whom perished.The Tunnel to Towers Run retraces Stephen’s footsteps on that fateful day. 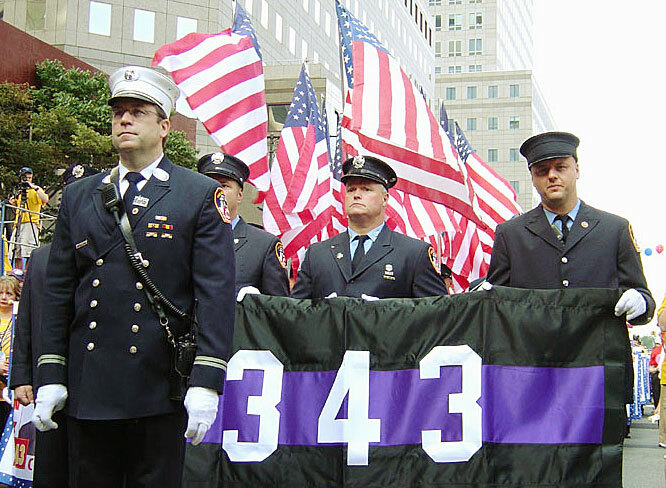 In running along his path, we honor the memory of all the Firefighters, Police, and EMS workers who performed their duty that day. In running this race, we are reclaiming still another part of the city for all our heroes and for all of those who died on 9/11. A large banner of the Firefighters Angel hangs above the crowds at the finish line to the Stephen Siller Tunnel to Towers run.